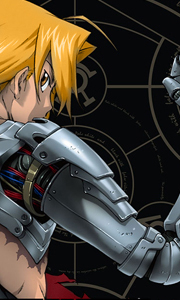 Edward and Alphonse Elric's reckless disregard for alchemy's fundamental laws ripped half of Ed's limbs from his body and left Al's soul clinging to a cold suit of armour. To restore what was lost, the brothers scour a war-torn land for the Philosopher's Stone, a fabled relic which grants the ability to perform Alchemy in impossible ways. The Elrics are not alone in their search: the corrupt State Military is eager to harness the artefa.. In the shadows beneath Central, the Elrics encounter Father, the creator of the Homunculi. His face is familiar, but his alchemy is unlike anything the brothers have ever seen. As Father’s dark plot takes shape, Ed and Al brave the frigid north to meet the top officer of the fortress Briggs: General Olivier Armstrong. With icy nerve and burning intensity, she commands the hardest soldiers in the land. When you witness her leading the wa.. Dark forces threaten millions of souls. How is the Elric family connected? The secrets are revealed in Fullmetal Alchemist: Brotherhood, Part Four. For the first time, the origin of Hohenheim’s alchemic power is exposed – as well as the history he shares with the first Homunculus. Yet, while the past is uncovered, the future remains perilously uncertain. Edward suffers grave wounds fighting alongside an unlikely band of former enemies. ..
Edward and Alphonse Elric's reckless disregard for alchem'ys fundamental laws ripped half of Ed's limbs from his body and left Al's sould clinging to a cold suit of armour. To restore what was lost, the brothers scour a war-torn land for the Philosopher's Stone: a fabled relic which grants the ability to perform alchemy in impossible ways. The Elrics are not alone in their search; the corrupt State Military is eager to harness the artif..
A fugitive alchemist with mysterious abilities leads the Elric brothers to a distant valley of slums inhabited by the Milos, a proud people struggling against bureaucratic exploitation. Ed and Al quickly find themselves in the middle of a rising rebellion, as the exiled Milos lash out against their oppressors. At the heart of the conflict is Julia, a young alchemist befriended by Alphonse. She'll stop at nothing to restore the Milos to ..
A fugitive alchemist with mysterious abilities leads the Elric brothers to a distant valley of slums inhabited by the Milos, a proud people struggling against bureaucratic exploration. Ed and Al quickly find themselves in the middle of a rising rebellion as the exiled Milos lash out against their oppressors. At the heart of the conflict is Julia, a young alchemist befriended by Alphonse. She'll stop at nothing to restore the Milos to th..
Own Fullmetal Alchemist - Collectors Edition - Part 2 - Episodes 28-51 Blu-Ray from Deff, DVD, Blu-Ray & 4K Video Specialists - Free UK Delivery..